So...you may realize by now, if you've been following Fluffy Fridays, that there are many, many cloth diaper choices out there. Right? Right...anyway, how do you really know if a certain brand is the best for you and your baby? Well, you could buy one of each kind, which can be costly...or you could have a Diaper Party! Yep, kind of like those other in-home parties you have been to...except this party will include several diapers for everyone to check out. It is always nice to see something first hand before you buy! Kristine, from U.P. 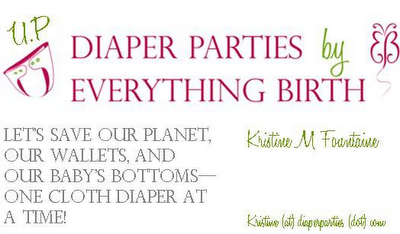 Diaper Parties by Everything Birth is a Diaper Party Consultant. Kristine has sent me a Happy Heinys diaper to try and review.... AND has offered a giveaway! First thoughts... looks pretty nice. The Happy Heiny diaper is a pocket diaper and it comes with two three layer microfiber inserts, a smaller one a larger one. The overall fluff factor isn't bad either. With both inserts in the pocket it can get quite fluffy, but I found that one insert was enough during the day. I had some issues with wicking at first...it took a few washes, but the last few times we have used this diaper we have had no problems. I can't say if it was our fault, something that happened in shipping, or if this is just a brand that requires a few extra washes. I really love the two snap tabs. These diapers have my favorite snaps so far. This diaper probably wouldn't fit on a newborn, but Happy Heiny's says they are confidant that an 4-6 week old 8lb baby will fit in the diaper properly. Overall, I think this diaper is a pretty good diaper and we use it fairly frequently. Go take a look at Diaper Parties...see what you like! 1 entry- Like U.P. Diaper parties on Facebook. Leave Facebook name in comment. Thank Kristine while you're there for this giveaway for an extra entry! 2 entries- Write a cloth diaper review for a diaper that you have tried, but doesn't have a review on Everything Birth yet. Thanked kristine on fb for the giveaway. ‎Six in the Nest sent me!! Thank you for the awesome giveaway!! My favorite product on Everything Birth, Inc. is the Flip System Diaper!! Check out Six in the Nest's awesome giveaway!! I posted the Six in the Nest button on my blog!! I hope that link works...I'm on a cell phone! My favorite item at everything birth is the bum genius 4.0 one size diaper. That's what we use and they are the greatest diapers! I like U.P. on facebook! I love the Marvels by Kissaluvs One Size Fitted Cloth Diapers the print is so cute! My comp isn't playing nice the tag didn't go through! I follow you with GFC and "like" U.P. Diaper parties on facebook.